If we calculate the amount of time we talk versus the amount of time we listen, what would be the ratio? Would it tilt toward talking or listening? James exhorts, “Everyone should be quick to listen and slow to speak.” (James 1:19) A good friend of our family died last year who had an uncanny ability to listen. If you would ask her how she was doing, she would quickly turn the conversation back to what was going on in your life. Last Sunday, I experienced the blessing of taking communion to a 95 year old gentleman, a widower who lives alone in the house that has been his for more than 40 years. In response to my question of “How are you doing today,” I heard about his wife of 52 years who died a few years ago; about his son who is a priest; about the many missions he flew in World War II and the Korean War; how he was a consultant to Congressional committees overseeing the Air Force, and finally, about his current health issues. What a blessing it was not to talk, but just listen. We have the opportunity to listen wherever we are — at work, at home, or social gatherings. If our desire is to learn and grow in each of these venues, we soon realize that we don’t learn much from talking, but we do from listening. As an attorney for a large corporation, I found that I was able to serve my corporate clients better by listening more. At home, I serve and love my wife and children better by listening more. At social events I honor our guests by listening more. While my experience is sometimes spotty in some of these areas, I try to change course as soon as I realize that I am talking too much. I have often allowed the noise of everyday life to drown out God’s voice, particularly when I am in my car, listening to music, talk radio, or sporting events. Today, I am trying to listen to the radio less and the Lord more. He says, “Be still and know that I am God.” (Psalm 46:10) Like Elijah, who went up on Mount Horeb to hear God, he did not hear him in the powerful wind, or the earthquake, or the fire, but in a gentle whisper. God loves to speak to us as a gentle whisper in our thoughts. Are we listening, or is the noise getting in the way? This entry was posted in Uncategorized on August 25, 2014 by stevedalgetty1. How Joyful Is Our Worship? While I begin my prayer time each day with a short bit of praise, I am not sure I fulfill the expectation of the psalms or the level of commitment suggested by Jesus’ characterization of the Greatest Commandment to “Love the Lord your God with all your heart and with all your soul, and with all your mind.” (Mt. 22:37) How often does my praise come from duty and routine instead of a joyful heart? Several years ago, our daughter Emily, who was born with Down syndrome, demonstrated how we should approach the Father with praise and worship. We were at mass and I was serving as a Eucharistic minister and just happened to be serving the isle in which she and my wife were coming forward. When she realized that she was coming to me for communion, her face lit up with that big bright beautiful smile of hers, she held out her cupped hands to receive the host and started running toward me exclaiming loudly, “Daddy!” She didn’t worry about what other people thought, for there is no guile in her, only purity of heart. It was an expression of complete and total love. As I was blessed to witness her response and give her the consecrated body of Christ, the following thought came into my mind: This is how God must feel when we unreservedly express our love for him, full of joy in praise, worship and song, intent on devotion and devoid of any concern about what others may think. This entry was posted in Uncategorized on August 18, 2014 by stevedalgetty1. When we read Matthew’s account of Jesus walking on the water and Peter’s attempt to get out of the boat and walk toward him, we tend to dwell on Peter’s apparent lack of faith which resulted in his sinking until he called out to Jesus to save him. Peter says, “Lord if it’s you, tell me to come to you on the water.” Jesus said, “Come.” (Mt. 14:22-33) Peter did so, but when he started to experience the wind and the waves, he began to sink. Still, of all the disciples, Peter was the only one who had the courage to attempt to accept Jesus’ offer to walk on the water toward him. He was the only one willing to get out of the safety of the boat. To the others, they no doubt thought it was foolish and reckless. It is a normal thing for us to seek safety and comfort, but sometimes the Lord calls us to step out of our safety and comfort to do something for him or to take an action for ourselves that is beneficial, even though to us, it may not appear so at the time. When I was in my mid-forties, I was offered a new assignment by my employer to oversee the delivery of legal services for our marketing, refining and supply operations in Asia, Africa and South America. It was a great job and would have certainly furthered my career, but would have required a move back to New York from our U. S. headquarters in Virginia. We had three teenage daughters at the time and a two year old son. Our daughters were all doing well in school, were involved in Young Life, a Christian outreach to high school teenagers and had great peers for friends. For three days, I agonized over the decision. While I didn’t think I would be fired if I declined the assignment, I knew it would have a negative impact on my career. There was a lot of pressure from my superiors to take the job and to decide quickly. The corporate culture fostered success, and moving up the corporate ladder was something highly valued. You were expected to accept promotions, not turn them down. After three days of prayer, consultation with colleagues, and lengthy discussions with my wife, we discerned that I should decline the offer. I had to get out of the boat of my corporate security and comfort to walk on the waters of going against the corporate culture at the time. The decision did have a negative impact on my career for a number of years, but when I look back today and see all that has happened in the lives of our children and all the blessings we have experienced in our family, I am absolutely confident that this decision was God’s will for our family and for me professionally. Our children went on to complete their education and have since married wonderful Christians who are all raising Christian families. For myself, my career eventually got back on track, and I was also led to become active in Christians in Commerce, a workplace ministry encouraging Christians to live out their faith in their work. There is more, but too much for this space. This entry was posted in Uncategorized on August 11, 2014 by stevedalgetty1. How much faith do you have in the name of Jesus? In Acts 3, Peter and John are entering the temple by the Beautiful Gate at the same time a man who had been crippled form birth is being carried there to beg. He asks them for money and Peter responds, “Look at us…Silver and gold I do not have, but what I have I give. In the name of Jesus Christ of Nazareth, walk” (Acts 3: 4, 6) Peter then takes his hand and lifts him up. His feet and ankles instantly become strong, he jumps to his feet and he begins walking, jumping and praising God. When the people recognize him as the man who had always been begging they are filled with wonder and amazement. When Peter said, “Look at us,” he wanted to get the man’s attention because what he was going to do was not the usual response of throwing a coin in a cup. This time was going to be different. Peter was going to give the man not what he asked for, but what he needed. He needed Jesus and healing. Peter gave him both. How much faith do you have in the name of Jesus? On a personal note, I have seen prayers in the name of Jesus: heal a hole in the heart of our daughter, Emily; restore vision loss in me from glaucoma; find wonderful Christian spouses for our four married children; hold my prostate cancer in remission despite a doctor’s prognosis; to name just a few examples. 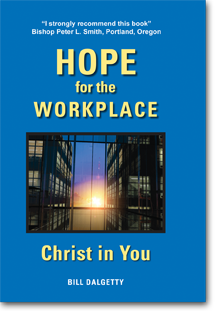 In the workplace, I have seen prayers in the name of Jesus: turn a negative work environment into a positive one; enable a person to forgive a business partner who defrauded him of thousands of dollars; result in a company deciding to forgo short term profits for the long term good of the company and its employees; heal a colleague’s brain tumor; lead a legal adversary to surrender his life to Christ before he died. Jesus says, “I will do whatever you ask in my name so that the Son may bring glory to the Father.” (John 14:13) When we pray in the name of Jesus we create an opportunity to bring glory to the Father. Bringing glory to the Father through the name of Jesus is not something that is confined to the early Church. Jesus’ words are meant for us today as well. Pray for something in the name of Jesus today and bring glory to the Father! This entry was posted in Uncategorized on August 4, 2014 by stevedalgetty1.